It's been tough to get into the studio lately, but I was able to revisit a couple of oils in the last couple of days and call them finished. It always feels good to bring them to completion. The upper left work, a 4' x 5' was already completed. Lower left, 48 x 48 inches and on the easel, 40 x 40 inches. 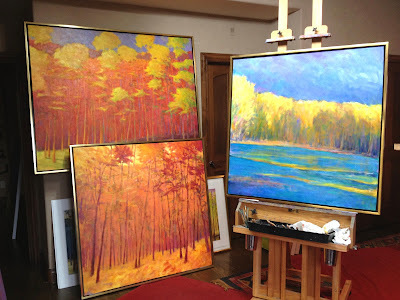 I'm very happy with the the many colors woven in, the edges, complexity and the presence that each of these works have. I may have mentioned before, but I like to see my works in the frames - even when they are in progress. These float frames allow me to just tip them in and out anytime. thank you Jan! Makes me want to do mo bigger next time!